Home / Berlin / #Berlin September 29: #Liebig34 must stay! #Berlin September 29: #Liebig34 must stay! Berlin: The Liebig34 is a self-organized, anarcha-queer-feminist house project in Berlin-Friedrichshain. The house was occupied in 1990 and later legalized. This contract expires in December 2018 and and we are not being given an extension: the owner, Gijora Padovicz, wants to clear the house, renovate it and rent it out again for maximum profit. Padovicz is known in Berlin for systematically buying up, clearing and destroying houses and residential projects. 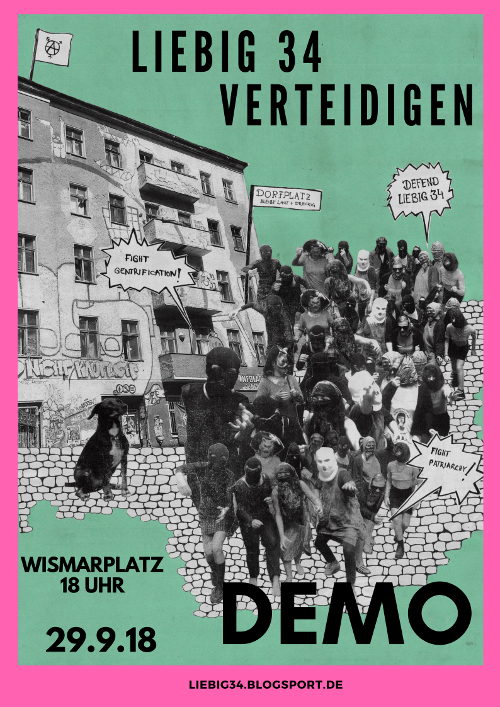 #Berlin: Defend #Liebig34! Support Queer Feminist struggles! First block without cis-men. 29.9.2018 18:00 at Wismarplatz – Enough is Enough! #Berlin: One Struggle, One Fight – #Weide63, #Liebig34 stay! – Enough is Enough!